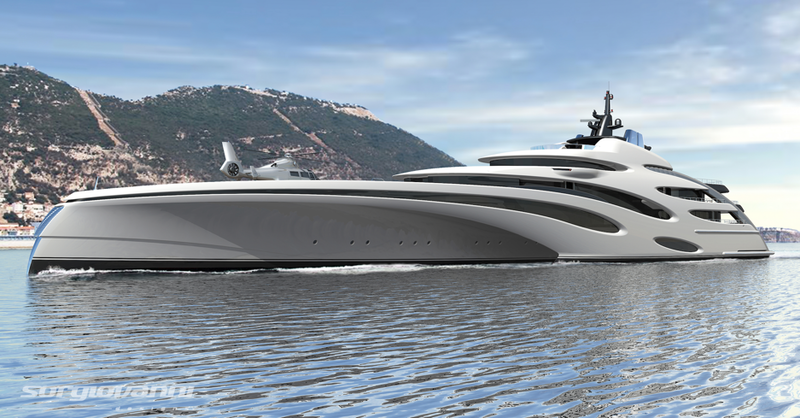 Sorgiovanni Design, Echo Yachts and One2three are please to announce their next exciting collaboration together. Sorgiovanni’s new 120m trimaran superyacht concept design delivers striking and progressive contemporary styling, a unique palatial interior layout and other features that capitalise on the inherent space and performance advantages of the trimaran hull form. Incorporating sweeping organic lines, a commanding presence and design fusion between the exterior and interior spaces, the design epitomizes the truly bespoke luxury and attention to detail that Sorgiovanni is renowned for. Suited to various propulsion systems including hybrid diesel electric with CP propellers, the extremely stable and efficient 120m trimaran with “at speed” ride control and optional “zero speed” Gyro motion control will provide exemplary sea keeping, ride quality and lower running costs. Large flexible interior and exterior accommodation spaces and careful placement of generators in the outer hulls will provide for a very quiet and luxurious experience onboard. Special features include: rotating Master Stateroom section, private Owners outdoor entertaining zone with private swimming pool, both indoor and outdoor dining settings for 26 guests, large majlis style lounge, large indoor cinema, glass central passenger lift, fully appointed gym / day spa, sundeck helipad, foredeck touch & go helipad, sundeck Jacuzzi / swim against pool, transformer sea stair and bathing platform and forward tender garage enclosed with gull wing style hull doors. Australia’s largest superyacht builder Echo Yachts is presently constructing the new White Rabbit and at 84m in length she will be the world’s largest aluminium superyacht and world’s largest trimaran superyacht being built to date. White Rabbit is the creation of renowned superyacht designer Sam Sorgiovanni who also designed the client’s previous vessel. Naval Architecture has been performed by aluminium high speed and multi-hull design specialists One2three Naval Architects with engineering being carried out by the Echo Yachts in house design team. The work undertaken by Echo Yachts at its purpose built superyacht facility in Perth is drawing upon their team’s vast experience acquired from Superyacht and high speed aluminium vessel’s built both locally and globally. The innovative trimaran design provides grand interior spaces, large entertaining decks, optimised energy efficiency and quiet operation with its diesel electric propulsion system. High levels of stability and ride comfort are integral to the hull design and are bolstered further by a customised Naiad active motion control systems providing the ultimate in oceangoing comfort. The build of the current 84m project is progressing well towards a Q1 2018 launch with the exterior painting and interior fitout well underway. Now the trio team are setting their sights on forging new records and applying their shared expertise and experience to the much larger 120m trimaran design announced today. Echo Yachts and Sorgiovanni Design are attending the 2016 Monaco Yacht Show and will be available for appointments.